What is an AxPointPresentation ? 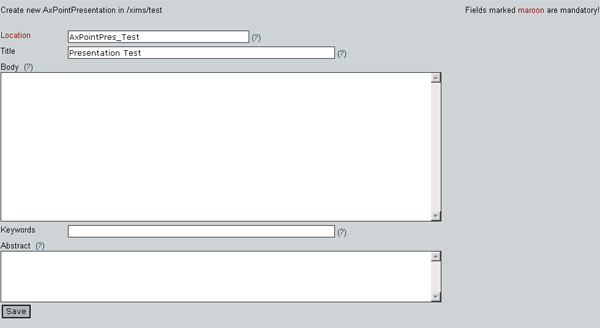 An AxPointPresentation is a XML-based PDF-slideshow. Ability to create slideshows with your choice of background image. Slideshows break down into slidesets, or not at your choice. Slides can show bullet points, source code (fixed font), or images. All elements of a slide can transition in too. Text on slides supports bold, italics, and colours. Colours can be any one of the 16 HTML colours, or defined as hex RGB values. PDF bookmarks to allow direct navigation to any slide. Chose "AxPointPresentation" from the menu, assign title and location and save it. To write the XML-code for the presentation you have to use a text-editor. The XML-body has to be well-formed. 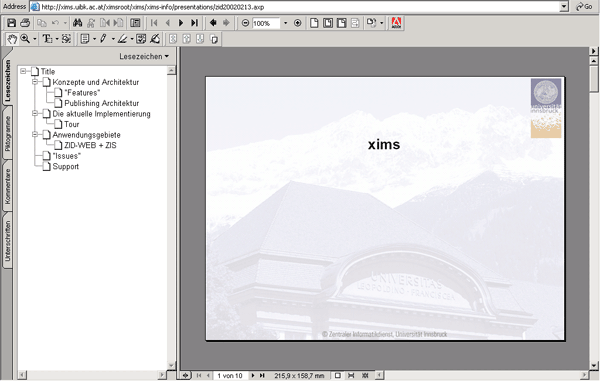 Copy-paste the XML-code into the XIMS-editor-window of your AxPointPresentation, save and publish it. An example of a presentation can be seen here.